In the wake of protests by Filipinos in Europe during Pres. BS Aquino’s recent trips to Spain, Belgium, France and Germany, global alliance of overseas Filipinos Migrante International issued a warning to Pres. BS Aquino against plans for a term extension. 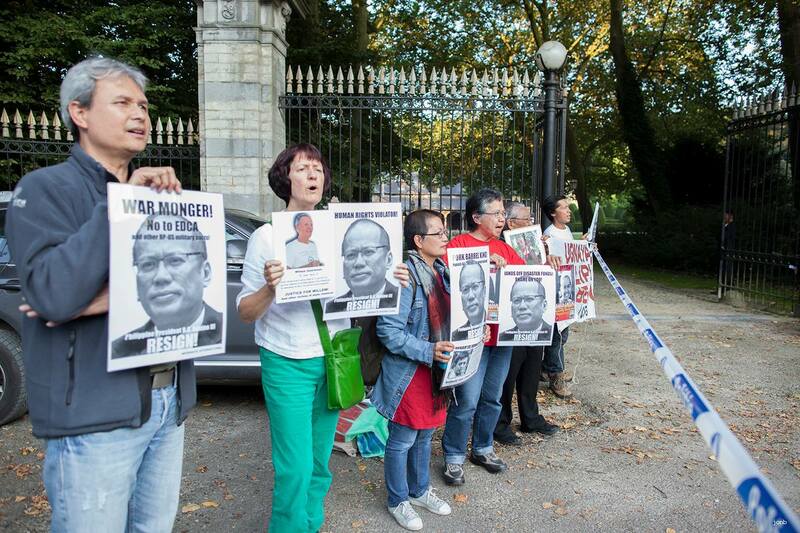 Migrante-Europe, together with other Filipino groups and human rights organizations, held series of protest actions last week in Belgium, France, Germany, Spain, Austria and Italy as BS Aquino commenced his 8-day European tour. According to Garry Martinez, Migrante International chairperson, the protests were meant to show the disgust and outrage of Filipinos in Europe and all over the world over BS Aquino’s corruption, puppetry and dictatorship. “It is a clear message to the international community that wherever BS Aquino may visit, Filipinos will always find a way to relay the message that they want him out. We do not want him to stay on until 2016, and especially beyond. We have had enough of four years of massive corruption, blatant subservience to US imperialist dictates and brutal leadership,” he said. “We condemn in strongest terms BS Aquino’s scheme to extend his term and be another Marcos. We firmly oppose any moves for charter change meant to legalize BS Aquino’s anti-people policies, such as the EDCA (Enhanced Defense Cooperation Agreement), 100% foreign ownership of lands and industries, and his refusal to abolish the much-hated pork barrel. We enjoin all Filipinos around the world to further intensify calls for the prosecution of BS Aquino and all involved in the pork barrel scam and all forms of corruption. We call on the international community to join us in calling for an end to impunity, political killings, torture and repression under the BS Aquino regime,” he said. Martinez also said that, like Marcos, BS Aquino is more concerned with exporting and exploiting cheap labor of Filipino workers in exchange for remittances. “When it comes to their rights and welfare, our OFWs are in an era darker than during martial law,” he said.